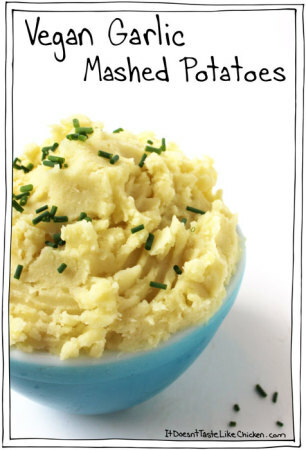 These vegan garlic mashed potatoes are sooooo creamy dreamy. Cover the potatoes with water in a large pot and bring to a boil. Boil for 15-20 until they are fork tender. In the meantime, in a medium saucepan, combine the garlic, non-dairy milk and coconut milk. Bring to a simmer and cook for 10 minutes. When your potatoes are cooked, drain, and return the potatoes to the pot. Mash and add about half of the garlic and milk mixture to the potatoes. Mix and add the remainder of the mixture until you reach the constancy you like. If you use all of the garlic and milk mixture and you would still like the potatoes softer, just add more coconut milk or non-dairy milk. Season with salt and serve.